Pádraig Harrington is congratulated by Shane Lowry after chipping in on the 10th hole during the final round of the Turkish Airlines Open at the Regnum Carya Golf & Spa Resort in Antalya. 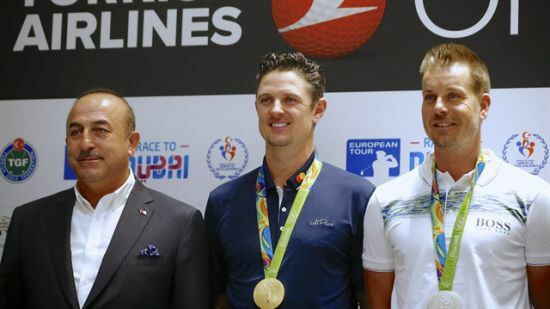 Pádraig Harrington could only doff his cap to Justin Rose after he produced his full repertoire of final-round fireworks and still came up two strokes shy of the in-form Englishman in the Turkish Airlines Open. The Dubliner went into the final round two strokes adrift of compatriot Shane Lowry and Thailand's Kiradech Aphibarnrat at the sumptuous Regnum Carya Golf & Spa Resort. But even though he chipped in for a birdie on the front nine, holed a 60-yard wedge shot for a miraculous par at the 10th to remain in touch and eagled the 15th to grab a share of the lead, his four-under-par 67 was only good enough for solo fourth behind the fast-finishing Rose. As Harrington was rolling in an 18-footer for eagle at the 15th, where Lowry found a watery grave and eventually shot a disappointing 72 to finish five adrift in a tie for eighth, Rose was in the process of putting together a sensational finish to follow his comeback win in the WGC-HSBC Champions a week earlier with another nail-biting victory. Having birdied the 15th, the 37-year-old former US Open champion birdied the 16th and then made another birdie from 10 feet at the 18th for a six-under 65 to overhaul playing partner Nicolas Colsaerts (66) and clubhouse leader Dylan Frittelli (64) on 18-under par. "I'm very happy leaving," said Harrington, who needed to hole his approach at the par-four 18th to force a play-off but came up 15 feet short. "I know I didn't win the tournament, but you know, Justin clearly went ahead and won it. I didn't lose it. I made it quite exciting at times out there, but I was happy with what I saw in myself." Harrington made just one costly mistake all day, three-putting for bogey at the 11th having spectacularly avoided dropping a shot at the long par-four 10th by holing out from 60 yards after finding water with a daring rescue wood from the pine trees. When he followed a three-putt bogey at the 11th with a two-putt birdie at the 12th, he was tied with Lowry on 14-under heading down the par-five 15th and very much in the hunt. But as the Offaly man found water short, dropping out of the title race with a bogey, Harrington made eagle to briefly join the lead only to discover one hole later that his rivals were going into overdrive.